Aip: American-International Pictures is Back! When an ancient underground civilization and their snake-like guardian plots to reclaim the surface world, those of the surface fights back. President Funazu: Like it? I call it Playmate Land. Just wanted to comment on some of the other statements made by people on this board. First,yes the special effects do not look like todays..but I for one like the pre-CGI effects. The special effects people had to be much more inventive and creative in the pre CGI days. 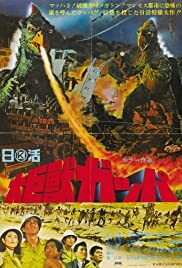 This movie doesn't have the great effects of some of the old monster movies such as the Ray Harryhausen(which are better than any CGI in my opinion)features and the Godzilla films,but it still makes pretty good use of miniature sets. Great movie for young kids or us older people who still remember what it was like watching these films as a child. I love watching these movies for nostalgic purposes as well. Sure it can be cheesy to some..but if you watch these films in the context that they were meant to be viewed..they can be very entertaining and enjoyable.